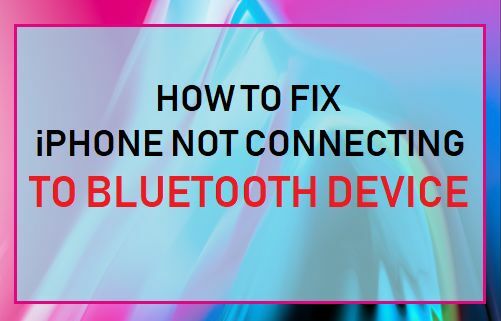 If you are seeing “Bluetooth has Failed” or “Not Connected” error messages on your iPhone, you should be able to fix the problem using methods as provided below to Fix the issue of iPhone Not Connecting to Bluetooth Device. 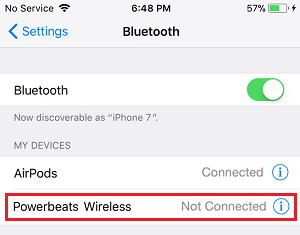 While trying to connect iPhone to Bluetooth enabled devices like AirPods, Speakers, Headphones and others, you may experience the following problems. Bluetooth fails to connect and you see “Bluetooth connection has failed” message on your iPhone. 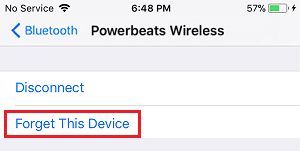 iPhone continues searching for Bluetooth devices, without being able to list them under “My Devices” section. iPhone fails to pick or recognize a particular Bluetooth device that you are trying to connect to. Bluetooth Device appears on your iPhone as “Not Connected”. The first recommended action to fix most problems on iPhone or iPad is to Restart your device. 1. Go to Settings > General > scroll down and tap on Shut Down. 2. On the next screen, use the Slide to power off button to Power OFF your iPhone. 3. Wait for 30 seconds and restart your iPhone by pressing the Power button. After this go to Settings > Bluetooth and see if you are able to connect to the Bluetooth device. In general, Bluetooth devices should be able to detect other discoverable Bluetooth devices located within 30 feet. However, in order to establish a proper connection, Bluetooth devices need to be within 5 feet of each other. Hence, make sure that your iPhone and the Bluetooth device that you are trying to connect to are located close to each other. 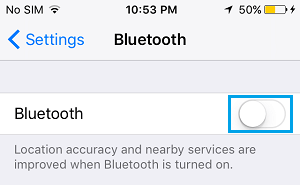 Go to Settings > Bluetooth > Toggle OFF Bluetooth and then toggle ON Bluetooth. After restarting Bluetooth, try to connect to Bluetooth device again. 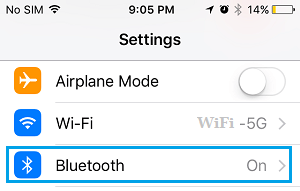 Forgetting the Bluetooth device might help in fixing the issue, if you see that the Bluetooth device listed as “Not Connected” on your iPhone. 1. Go to Settings > Bluetooth. 2. On Bluetooth screen, tap on the i icon located next to the device that is not connecting to Bluetooth. 3. On the next screen, tap on Forget this Device. Make sure that the Problematic device has been removed and not appearing under “My Devices” or Other Devices section on the Bluetooth screen. 4. Now try to connect your iPhone to the Bluetooth device again and see if your iPhone is able to establish Bluetooth connection with the device. If you still see “Not Connected”, tap on the Device Name on Bluetooth screen and you should be able to connect. 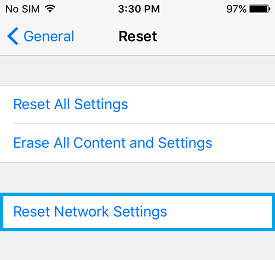 Make sure that you note down the WiFi Network Name and Password, before following the steps below to Reset Network Settings on your iPhone. 1. Go to Settings > General > Reset and tap on Reset Network Settings option. 2. On the next pop-up, tap on Reset Network Settings again to confirm. 3. 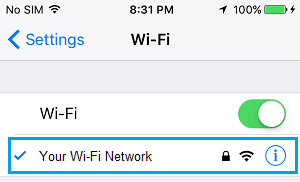 After this go to Settings > WiFi > tap on your WiFi Network Name and sign-in using your WiFi Network Password. Now, see if you are able to connect to Bluetooth device. 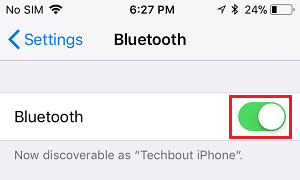 Follow the steps below to Reset Bluetooth on iPhone or iPad. 1. Open Settings on your iPhone and tap on Bluetooth. 2. On the next screen, switch OFF Bluetooth by moving the toggle to OFF position. 3. 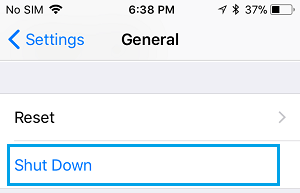 The next step is to Hard Reset your iPhone by pressing Power, Home or Volume buttons, depending on the model of your iPhone. iPhone 5, iPhone 6: Press and hold Power + Home button on your iPhone, until you see your device restarting with the Apple Logo. iPhone 7, iPhone 8, iPhone 9: Press and hold Power + Volume Down buttons, until you see the Apple Logo. iPhone X: Power OFF your device > Press and Hold the Side button (Power button), until you see the Apple Logo appearing on the screen of your iPhone. 4. After the Phone Restarts, go to Settings > Bluetooth and Switch ON Bluetooth. Now, try to connect iPhone to the Bluetooth device. If you still see “Not Connected”, tap on the Bluetooth Device Name on the Bluetooth screen and you should be able to connect. Devices like Microwave Oven, WiFi Router and USB 3.o port enabled devices are known to interfere with Bluetooth connectivity. Hence, make sure that you move away from computer with high-speed USB 3.0 port and see if moving away from the WiFi Router helps in fixing the problem. It is possible that the problem lies with the other device that you are trying to connect to. An easy way of confirming this is to try to connect your iPhone to another Bluetooth device (say Windows PC) and see if your iPhone is able to connect to this device. If the problem lies with the other device, restart the other device and see if this helps.